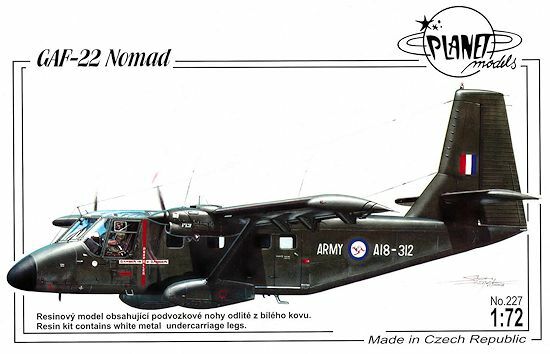 The Government Aircraft Factory N.22 Nomad first flew in 1971, a twin engine STOL transport, it was developed to maintain production at GAF after the Mirage contract was completed. It was a designed to seat 10 passengers or be converted for freight. It was widely demonstrated and sold around the world. 172 were built and it was operated by a variety of military and civilian users. It has a poor safety record, with 29 crashes and 95 fatalities. A common cause for crashes was tailplane failure. The prototype of the stretched version, the N.24, VH-DHF, crashed at Avalon in 1976. After a crash of the ARDU operated A18-401 in 1990, the RAAF grounded it's fleet, however it was still operated by the Australian Army until A18-303 crashed in 1991. The most recent crash was Philippines Air Force No. 18, which crashed in 2010 killing 9 people. A number are preserved in museums around Australia, there are the remains of one at a local scrapyard near my house. In a strong top opening box, about 70 resin parts are enclosed in a segmented bag. There are white metal undercarriage legs, two vacformed canopies and a piece of clear card. I did not open the bags so provided a scan of the parts from the instruction sheet. The resin parts are thin, and well moulded, with a little flash around the edges and in openings such as the cabin windows. Some parts are slightly warped. There is very fine, both engraved and raised, thin line detail on the larger parts. The cabin has 10 seats as the only detail, the cockpit has additionally an instrument panel, control yokes and centre console. The wheel wells have some basic moulded detail. The propeller blades are separately moulded and need adding to the hubs. The undercarriage legs are cast, well detailed, white metal. Resin legs that thin would not support the model. The instructions mention that weight will need to be added to the nose, there is no mention of how much. This kit looks to be a real tail-sitter, but there is not a lot of space for weight. The vac-formed canopy is very thin and clear, with the panel lines well marked. A spare is provided. A clear card is provided for the ten small cabin windows, but these would be better done using white glue. 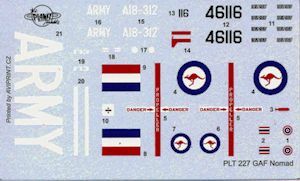 The decals have markings for two aircraft, an all green Australian Army example, and a camouflaged plane of the Royal Thai Air Force. I had to adjust the brightness of the decal scan to bring out the white markings. The instructions are two sheets of A4, clearly printed in Czech and English, with a short history, pictures of the parts and decals and a brief guide to working with resin. 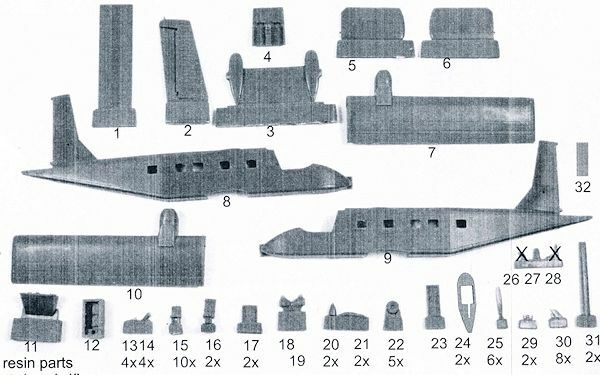 An eleven stage photographic assembly sequence is provided, with most of the parts placement clearly shown. A full page is devoted to full colour profiles and decalling guides, with generic names for the paint colours. The instructions are adequate to construct the model. A nice resin kit of a small transport and utility aircraft. It was operated by a wide variety of civil and military users so there is scope for a number of schemes beside those supplied with the kit. It may be possible to model the N.24 version by stretching the fuselage. A bit expensive, but that's Czech resin. Recommended.